We are one of London’s most experienced wealth advisory groups, and passionate about providing long-term, conservative, reliable investment solutions to business owners, medical professionals, affluent retirees and their families. We manage your account similar to a pension fund. Never chasing the highest rate of return, taking uncalculated risks, or speculating, we instead invest within predetermined parameters and follow a balanced, conservative approach. Supported by TD Specialists, we engage institutional-quality Portfolio Managers with proven track records who run some of the largest funds and collaborate with the big banks to bring you what we believe is the very best in research, due diligence and investment strategies. We are committed to full transparency and put your interests first. Our team strives to deliver unbiased investment advice, with no obligation to recommend the bank’s products or platforms. We find most people are pleasantly surprised about our fair fees; we are very value-conscious. Most of our clients pay an asset-based fee instead of trading commissions, which aligns our interests while helping to lower their costs. We design a customized investment and wealth plan for each client, engaging other TD Specialists when required. We believe that even the most sophisticated investors need a long-term, big-picture plan of the steps needed to help them grow and preserve their wealth that includes estate planning strategies, tax-efficient wealth transfer and more. If you are retired or about to be, we practice prudent risk management and are conservative advisors to help preserve your precious capital base and generate a steady stream of income. We will help you determine the amount of capital you need to set aside to generate a sustainable income. Medical professionals deserve to enjoy their wealth after spending years in school, assuming debt and working hard to establish a practice. We understand your specialized needs and restrictions, and by working with our network of professionals, we can help advise you on your medical corporation, RSP, insurance policies, real estate, and other holdings. For business owners, TD Bank Group can provide advice and referrals utilizing its strong network, which can benefit entrepreneurs and help diversify your portfolio. We provide attentive, approachable service and book regular meetings in advance. We speak in clear terms, convey timely market and investing information, and host seminars with top money managers. 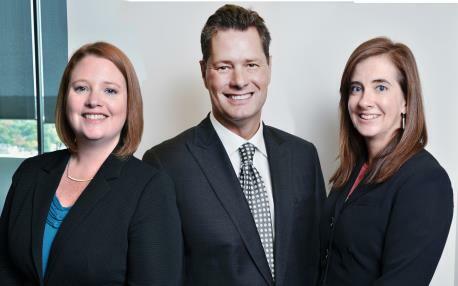 St. Croix Wealth Management consists of John St. Croix, Senior Vice President & Investment Advisor; Lynne Salvail-Bidmead, Associate Investment Advisor and Vann Robson-Hayes. St. Croix Wealth Management is part of TD Wealth Private Investment Advice, a division of TD Waterhouse Canada Inc. TD Waterhouse Canada Inc. is a subsidiary of The Toronto-Dominion Bank. John began his career with Investors Group and joined their top ranks before the age of 30. At Midland Walwyn, he was one of their top advisors and named Merrill Lynch Manager of the Year in 1998. As Branch Manager of TD Wealth Private Investment Advice London, John earned National Branch of the Year in 2010, 2012 and 2013. He has published more than 50 articles in the London Free Press’ Saturday Business Edition and authored two books, Tips from the Top as well as The Baby Boomer’s Guide to Wealth and Investing. Despite all these accomplishments, the measure of success John values most is his clients’ trust. John has received the Queen’s Golden Jubilee Medal for public service. He served as Governor on the National Board of the Red Cross, on the fundraising committee for the Salvation Army Centre of Hope and the committee to expand London Health Sciences. On the Board of the Catholic Diocese of London, he is Vice Chair of the Seminary Foundation, and Secretary, Treasurer and Chair of the Financial Committee. John also runs a training course to mentor young advisors at TD Wealth. Lynne has a degree in Analytical Chemistry and speaks fluent French. She entered the investment industry with Dundee Wealth Management in 2000, then moved to TD Wealth Private Investment Advice in 2005. Lynne has been with our team since 2011. Lynne’s analytical abilities transition well into finance – she is adept at problem-solving. Her primary focus is investment and wealth planning; she also gathers research, prepares tax packages, manages quick-turnaround projects and acts as John’s right hand when he is out of the office. Lynne is a Life Insurance Advisor with TD Waterhouse Insurance Services Inc. and is in the process of becoming a Certified Financial Planner (CFP®). Vann has more than 15 years of experience in the investment industry. She graduated from the Financial Services program at Fanshawe College and joined CIBC Wood Gundy in 2001 as an Investment Advisor Assistant. She moved to TD Wealth Private Investment Advice in 2012 and joined our team in 2017. Vann holds a Certificate in Advanced Investment Strategies and is in the process of completing the Chartered Investment Manager designation. Her main focus is advising clients and building relationships. As Youth Exchange Officer for the Rotary Club of Downtown London, she is involved with foreign exchange students from around the world. She is also quite involved in a few charitable initiatives including the CIBC Run for the Cure, the Business Cares Food drive as well as the Back in Class backpack program for local children.